How did this patient hear about Glengariff? Mr.Kazolas was previously a patient at Glengariff for short-term rehabilitation in early 2018. Mr. Constantinios Kazolas arrived from St. Joseph Hospital to our community on January 2nd, 2019. Upon his arrival, Mr. Kazolas was very distraught. He had been in this difficult situation since being in the hospital on New Year’s Day due to complications with his heart rate. As he entered our short-term rehabilitation community at Glengariff, he immediately felt more at ease. His road to recovery had begun. Being a patient at Glengariff in March of 2018 after having Hernia surgery, Mr. Kazolas had a great experience at Glengariff, which is why he chose to return as a patient once again. After being greeted by the patient advocate Margaret, and director of concierge services Teddy, Mr. Kazolas was shown to his room where he met the rest of the Glengariff team. He was introduced to his nurse, Susie, and nursing supervisor, Maria. A few moments later he received his initial screening performed by the physical therapist, Noel, and occupational therapist, Autumn. After being evaluated, a plan was put in place to ensure that Mr. Kazolas would meet his goals by the time he was ready to go back home. During his first rehabilitation session, Mr. Kazolas was limited to ambulating only 25 feet with a rolling walker, and needed assistance for transfers and accomplishing his ADL’s (Activities of Daily Living). Working daily with Olga, his physical therapist, he doubled his ambulating distance. He was then completing 50 feet with a rolling walker. Achievements just as large were also made with the help of his occupational therapist, Grace. When he arrived at Glengariff, Mr. Kazolas was only able to complete transfers and complete his ADL’s with minimal assistance, but after a full week of daily occupational therapy sessions with Grace, he was then performing transfers and his ADL’s with only close contact guard and direct hands-on assistance. By his third week at Glengariff, Mr. Kazolas kept on seeing improvements in his physical abilities. He was now ambulating a total of 75 feet with a rolling walker and was completing his transfers and completing ADL’s with distant supervision. Along with gaining strength, this progress made Mr. Kazolas more confident which lead to continuous improvement. He knew that in order to go home, he still wanted to become even more independent. With this goal in mind, by the start of his final week at Glengariff, Mr. Kazolas was walking an astonishing 100 feet with a rolling walker and performing his ADL’s with independence. He was amazed at the difference in his physical capabilities from his day of admission to the day of discharge. He was now informed by the social work department that his discharge plan can now begin, and he would be able to go home by the end of the week. In addition to the excellent progress Mr. Kazolas made in the Glengariff rehabilitation department, he also enjoyed a variety of activities and services offered at Glengariff. Like most patients, Mr. Kazolas enjoyed eating his meals in the Glengariff dining room. He made friends and enjoyed the food and beverages brought to him at his table with a warm smile by the staff. After he would finish his afternoon rehabilitation session, he would participate in recreational activities such as music performances, movie showings, coffee and cookies hour, and all sorts of games! These hours helped him keep his mind off the rehabilitation process and even made his stay enjoyable. Mr. Kazlolas was very happy with the nurses and aides who would take care of him with care and ease. His medications were always brought with a positive attitude and his aide, Norma, always took care of his daily needs with genuine concern. As the time to go get back home neared, Mr. Kazolas met with his social worker, Malissa, who explained to him the process of discharge. She informed him about the specialty equipment he would need at home and assured Mr. Kazloas that she would place the order and have everything delivered and ready for the day of discharge. How did this patient hear about Glengariff? Bessie had heard about Glengariff from a friend of hers at church. The friend had been a patient at Glengariff when needing subacute rehabilitation after a back surgery. After hearing about the wonderful stay that her friend had, Bessie had no doubt that Glengariff would be the place for her in order to get back home safely. Upon her arrival, Ms. Bessie Harvey was graciously welcomed to Glengariff by Margarette, the patient advocate, and Teddy, director of concierge services. Bessie was immediately shown to her room where she was met by the clinical team that consisted of Ms. Ramos, the director of nursing, and Jean, the unit 2 nursing supervisor. After Bessie’s CNA (Certified Nursing Assistant), Sandra, helped her unpack and settle into her new room, she was met by Noel and Autumn from the therapy team, who are the community’s physical and occupational initial evaluators who would be giving Bessie her screening to put a plan in place for Bessie’s rehabilitation process. After Margarette and Teddy went over the daily schedule, Linda, the dietitian, went over food preferences and some of Bessie’s dislikes to make sure she would receive food that she would enjoy throughout her stay. The very next day, Bessie started her first day of rehabilitation on the main floor gym. Upon her arrival, Bessie was limited to doing her activities of daily living with requiring some assistance. This included actions such as bathing, toileting, and transferring from the bed to the wheelchair. She worked every day with her occupational therapist, Vinny, who was able to aid her in strengthening her upper body up until the point where after only one week she was now performing her ADL’s (activities of daily living) with only limited supervision. In physical therapy, she made great strides as well. On her first day in rehabilitation, Bessie was only able to ambulate 25 feet with a rolling walking while requiring contact guarding from Sheba, the physical therapist. After one week, she was walking 100 feet with a rolling walker without any contact guarding. By her second and final week at Glengariff, Bessie made even more excellent progress. In occupational therapy, she eventually was doing all her activities of daily living with total independence. In physical therapy, she saw great gains as well, as she was now ambulating 150 feet with a rolling walker and only distant supervision. Bessie was so thankful towards Vinny and Sheba for helping her make so much progress in her physical abilities after her knee revision surgery. Aside for the positive experience she had in the rehabilitation department, Bessie made sure to participate in the activities that the Glengariff recreation team offers on a daily basis. Bessie had always loved interacting with others and enjoyed competing in various games. Bingo was one of the games that she had always loved at home and was ecstatic to see that it was played at Glengariff. She also took part in the coffee and cookies hour every afternoon in the bistro area where she met fellow patients and got to know them better. Her favorite portion of the day was dining for lunch and dinner in the main dining room. Like a restaurant, the drinks, soups, salads, and main dishes were brought to the table by the Glengariff staff. She sat and conversed with her friends and enjoyed every single meal. The team at Glengariff was proud to assist in the rehabilitation process for Bessie. Bessie and our team put in the work and dedication required to ensure a successful discharge home, and back to the quality of living Bessie had prior to rehabilitation journey. Reason for stay: Spondylolisthesis, lumbar region. Back surgery procedure completed at St. Francis Hospital. How did this patient hear about Glengariff Healthcare Center? Although this was Ann’s first time at Glengariff as a patient, she was already familiar with Glengariff as her husband, Joseph, had recovered from a knee replacement surgery five years ago. Both Joseph and Ann were so impressed with the care provided at Glengariff, that she decided to receive short term rehabilitation services at Glengariff for her own journey to recovery. Ms. Ann Ammirati arrived at the short rehab Pratt Pavilion center of Glengariff Healthcare Center in hopes of making a full recovery from her recent back surgery. Ann and her husband were greeted at the entrance of Glengariff by our Concierge, Teddy, and patient representative, Margarette, as her ambulance arrived to the entrance. After being introduced to the department managers, she was shown to her room. Ann was pleasantly surprised to see the admissions nurse and CNA’s arrive to her room only moments after she and her husband arrived. Maxine, her certified nursing assistant, made sure to unpack her belongings as Teddy and Margarette began explaining the process of how she would make a full recovery from her surgery. After the nursing supervisor, Jean, connected with Ann to address her clinical inquiries, she was welcomed by the team from physical and occupational therapy. Suniel, the assistant director of rehabilitation, and Joe, her occupational therapist, performed their initial screenings in order to set goals and put a plan in place for her recovery. They took the time to explain to her what would be some of the aspects in therapy that they will be putting extra emphasis on in order to have her back on her feet. Being that Ann and her husband were both avid travelers who even owned an RV, it was very important to her to ensure that she received the best physical therapy, which is what she associated with Glengariff from speaking with previous patients. Ann’s husband had been a patient at Glengariff five years prior to her stay, and he received exceptional care and therapy, which enabled him to return on the road only a few weeks after being discharged. This past experience made the decision for Ann to heal at Glengariff an easy one. During her first day in the Glengariff gym, Ann was only able to ambulate a total of 50 feet while using a rolling walking and having the immediate assistance from her physical therapist, Noel. In occupational therapy, Ann wanted to put great focus on car transfers, which is why she and her occupational therapist ensured that she make use of Glengariff’s simulated car. During her first day of OT, Ann was only able to complete ADL’s (activities of daily living) such as toileting and bed transfers with minimal assistance and could not yet perform these tasks independently. With much work and help, by day five Ann had already begun to see outstanding progress in both PT and OT. She was now ambulating 75 feet with a rolling walker with only close contact guard from Noel. This was a big accomplishment for Ann as she expressed how motivated she felt after seeing such great progress in less than a week’s time. She made similar gains with the continued help of Joe. By the end of day five, Ann was completing her transfers with only supervision and no immediate assistance. She was so glad to get back to being able to toilet, shower, and get in and out of her bed by herself. Joe taught her how to make use of the various safety grab bars that Glengariff encompasses throughout its therapy center, which helped strengthen her upper body. On the day before Halloween, it was Ann’s final day in the gym. On the 7th day of her stay, she could not believe that she was already ambulating 100 feet with a rolling walker at distant supervision and simultaneously completing her ADL’s with distant supervision. This meant that Ann was now walking with her walker and completing transfers all independently. It was hard for Ann to comprehend that only a week prior to this, she could barely walk half that amount and also could not complete any normal day tasks without direct help. She was now able to envision herself getting back home with her husband and going back to doing the things she loved. Aside from Ann’s experience in the therapy gym, she also made sure to take advantage of the many activities and social gatherings that Glengariff offered. Ann very much enjoyed going down to the dining room led by Margaret. Ann also truly enjoyed sitting with some of the other patients who were in a similar situation to her and enjoyed listening to the fascinating stories of their recoveries. The dining room experience consisted of receiving drinks, soups, salads, and delicious main courses. Ann looked forward to the restaurant like dining experience at lunch and dinner daily. She also enjoyed socializing at the daily coffee and cookies social that took place in the Glengariff bistro. It was at the time that she could sit with her husband and chat about how the day had been going so far. Ann really enjoyed taking part in the various games such as bingo and the virtual reality experience, where she was able to see some of the places she had visited in 3D! This encouraged her to stay positive and attend therapy even when she was slightly tired. Reason for Stay: Presence of right artificial hip joint as well as unilateral primary osteoarthritis in the knee. How did this patient hear about Glengariff Healthcare? As per the recommendation of Ms. Merin’s orthopedic surgeon, Dr. DiMaio from St. Francis Hospital, she and her brother received a wonderful tour by the Glengariff admissions team. They were so impressed with our community that they chose Glengariff immediately. Ms. Nancy Merin arrived at Glengariff Rehabilitation and Healthcare Center on September 27, 2018 with the intention of rehabbing from her recent hip replacement surgery. Upon her arrival from St. Francis hospital, Ms. Merin was immediately greeted by the Director of Concierge Services, Teddy, and Patient representative, Margarette. Both Teddy and Margarette showed Ms. Merin to her room where she was introduced and welcomed by the nursing staff, dieticians, rehabilitation team, and social workers. After getting acquainted with the department managers, Ms. Merin was pleased to share some personal details about herself with Teddy, such as her hobbies, food preferences and shared details about her family and friends. This allowed for a more personal stay at Glengariff. Ms. Merin expressed to all the staff members upon her arrival, that she had many questions and concerns about what her rehab program would look like. She expressed to the team that her main focus during her stay, would be to receive daily rehab therapy in the state-of-the-art therapy gym that she had seen on her tour of the facility. Being that she lived alone, it was crucial for Ms. Merin that she get back to her home doing her activities of daily living in a timely and independent fashion. She was assured by the Glengariff team that she would receive a therapy screening that very day. She was amazed to see that only a few moments later both an occupational and physical therapist arrived at her door to give her an initial therapy screening to ensure that the proper rehab plan be put in place for her to reach all of her goals. Prior to her hospital stay, Ms. Merin had been living independently in Long Island after moving all the way from Alaska. She showed much passion and energy and took much enjoyment in cheering up all of those around her. She participated in many of the recreational activities throughout her stay, such as music, bingo, and the coffee and cookies hour, which was offered daily in the bistro lounge of the facility. She expressed to Teddy how surprised she was to have formed such close relationships with other patients during these various activities. Ms. Merin formed many relationships with her therapy and nursing staff as well. Her favorite aid in the facility was Maggie who made sure to take care of Ms. Merin’s every need and constantly go the extra mile for her. Ms. Merin was glad to have been informed about the Ray of Sunshine Program that Glengariff offers, where patients have the ability to compose personalized thank you cards to staff members that make their stay extra special. Ms. Merin went on to write multiple cards for Maggie and the other aids and nurses on her floor, thanking them for their warm and timely responses to all her requests. Ms. Merin also informed Teddy how much it meant to her when he and Margarette would come in on a daily basis to follow up with her about her health and the quality of her stay. Upon her initial therapy screening, Ms. Merin was limited to ambulating only 50 feet with the assistance of a therapist providing close contact guard as she used her rolling walker. She also did not have the ability to climb stairs after the hip surgery. With the help of her physical therapist, Mike, Ms. Merin worked daily in the rehab gym to get back to her prior state of physical mobility. After just seven days of receiving physical therapy, she was now ambulating 150 feet with her rolling walking while only requiring distant supervision. 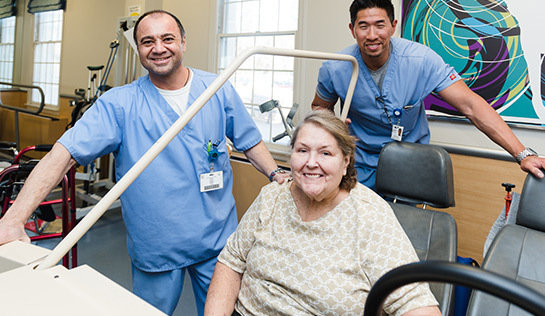 Ms. Merin had now met her goals initially set in physical therapy. In occupational therapy, Ms. Merin had also made incredible progress. Upon her arrival from the hospital post-surgery, her upper and lower body functions, including toileting, required her to have moderate assistance at all times. With the help of her occupational therapist, Chris, Ms. Merin worked every afternoon for seven days to meet her goals, which she ultimately met. On her 7th day at the community, Ms. Merin was toileting on her own and had improved her upper and lower body functions to being fully independent with only requiring distant supervision. Aside from all the progress she had made in therapy, Ms. Merin shared how wonderful of an experience she had at Glengariff. She expressed how impressed she was with the team at Glengariff always going the extra mile to make sure that she was comfortable and high-spirited. The highlight of her stay was the Oktoberfest celebration that took place on October 1st. The grand celebration consisted of root beer, apple ciders, and an enjoyable concert to wrap up the festivities! Ms. Merin explained that initially all she wanted to do was rehab and get home as soon as possible, but upon her discharge, she proudly shared with the team how attached she had become to all of the friendly staff and all the new friends she had made during her stay. Ms. Merin stated, “It is difficult for me to fully express my gratitude and appreciation to all of the staff at Glengariiff. They made my stay so pleasant and all played a role in my rehabilitation here. I enjoyed my stay at Glengariff so much that I will be returning in January for my scheduled knee replacement surgery.” We wish Ms. Merin the best of luck returning to her home and hope to only hear great news from her in the future! Have You Heard Glengariff Rehabilitation and Healthcare Center On The Radio? Posted in In the Press, News and Events	| Comments Off on Have You Heard Glengariff Rehabilitation and Healthcare Center On The Radio?